First, we took our rally to the Capitol steps. Just as crowds began to gather, no doubt curious about our megaphone and pointing to our “I HAD AN ABORTION” and “I STAND WITH 1 IN 3” signs, we were shooed away by police to the more distant location shown in the above photo. We had been in the path of — you guessed it — President Trump’s motorcade. He was making his last-gasp attempts to salvage the Republican bill to repeal and replace the Affordable Care Act/Obamacare. How appropriate to see, just days later, his plan aborted. The rest of our day was devoted to visiting offices of representatives and senators. Our goal for the House of Representatives was to enlist more sponsors and bolster support for the EACH Woman Act (“Equal Access to Abortion Coverage in Health Insurance”), which would overturn the 1976 Hyde Amendment that prohibits government funding for abortions. 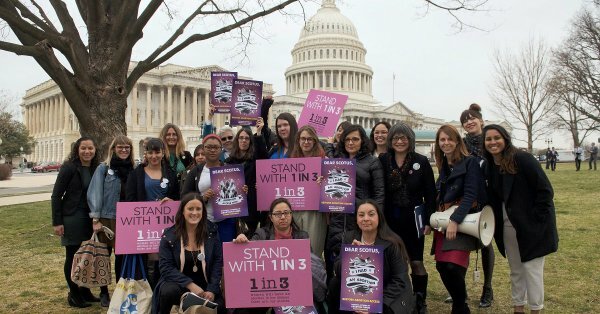 The EACH Woman Act was first introduced in 2015 with the goals to require the federal government to ensure coverage for abortion care for (1) federal employees receiving government-sponsored health insurance, and (2) recipients of public health insurance programs, including Medicaid, Medicare, and the Children’s Health Insurance Program. The legislative strategy is to introduce this bill every year until it passes. Maryon Rocha and I, the Arizona team, walked to Sens. McCain’s and Flake’s offices, as well as to Reps. Raúl Grijalva’s and Tom O’Halleran’s offices, our respective House members. We met with legislative staff members responsible for women’s health legislation. As we told our abortion stories face-to-face, I saw how powerful these first-hand accounts were. When I spoke of the terror of riding in a car with strange men in Tijuana, Mexico, to undergo my 1965 illegal abortion, the pained looks on the faces of my listeners were unmistakable. How successful were our pleadings, entreaties, and 2018-election, we’re-watching-you threats to Sen. Flake, whose first term comes to a close next year? Only time will tell, but I am sure the impression we left was strong and made a greater impact than any briefing document or paid lobbyist could have. 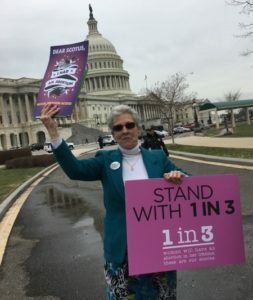 … how hard it is to be a young woman denied the morning-after pill, then, sure of her abortion choice, trying to break a vicious cycle of poverty, but faced with strong religious push-back. Monserrat’s story (starting at minute 42:28). … women can still die of pre-eclampsia and eclampsia. (You might recall the episode in Downton Abbey when Lady Sybil died of eclampsia during childbirth.) Listen to Susan’s own heartbreaking 1989 24-month-pregnancy story (starting at minute 3:20). … women who never want children can be denied permanent birth control — sterilization. Listen to the frustrations of Candice (starting at minute 42:40). … a 20-week ultrasound, accompanied by that first ultrasound picture, is not always the happy event we so often hear about. Neomi’s story (starting at minute 38:57) illustrates the nightmare that can happen instead. … how heartbreaking it is to “save my baby from life.” Jocelyn’s story (starting at minute 1:08:43). If you take the time to listen to these stories (or any of the six hours of video that pop up with them on YouTube) and gain no better understanding of what happens to pregnant women seeking abortions in real life, listen again until you get it! OK, the lecture is over. Now get crackin’. Learn more on Twitter or Facebook. Go to the 1 in 3 website. Tell your abortion story. Ask your women friends if they had an abortion and your men friends about their role in women’s abortions. Volunteer. Liberate yourself. This entry was posted in Abortion, Activism and tagged 1 in 3, abortion, Affordable Care Act, American Health Care Act, back-alley abortion, Children's Health Insurance Program, CHIP, EACH Woman Act, eclampsia, foster care, Hyde Amendment, illegal abortion, Jeff Flake, John McCain, Medicaid, Medicare, Neil Gorsuch, Obamacare, preeclampsia, Raul Grijalva, South Tucson, Supreme Court, Tijuana, Tim Kaine, Tom O'Halleran by Anne Hopkins. Bookmark the permalink. Thanks Anne, for doing this. It’s hard to believe this is still where we are – I’m the same generation as you.